The U.S. Treasury’s Office of Tax Analysis (OTA) has released a dynamic scoring of the economic benefits of three fundamental tax reform plans—including two plans suggested in the final recommendations of the President’s Advisory Panel on Federal Tax Reform last November. The OTA scored the plans using three popular macroeconomic growth models: the Solow growth model, the Ramsey growth model, and an overlapping-generations life-cycle model. 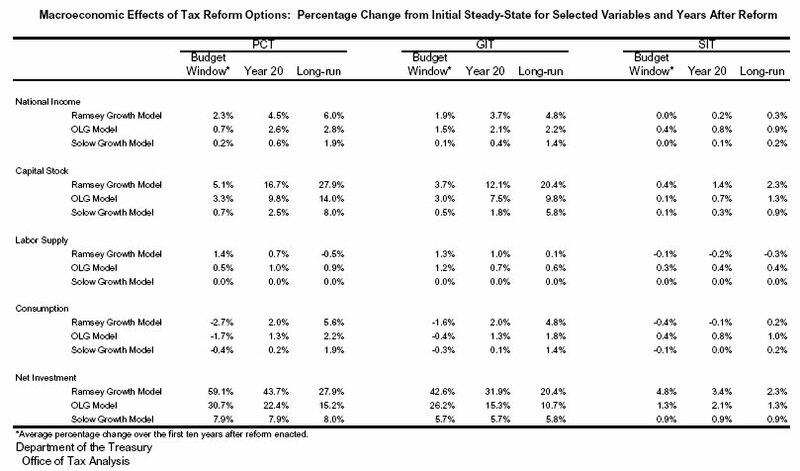 Table 3 shows the effects of the Progressive Consumption Tax on selected economic aggregates. We expect that a switch to a consumption tax would lead to more saving and investment which would translate into higher levels of output and eventually into higher levels of consumption. Each of our three models obtains these qualitative results. In the long-run, for example, the capital stock compared to the baseline increases by 27.9 percent in the Ramsey model, 14.0 percent in the OLG model, and by 8.0 percent in the Solow model. This leads to an increase in national income (Net National Product) of 6.0 percent in the Ramsey model, 2.8 percent in the OLG model and by 1.9 percent in the Solow model, while consumption rises by 5.5 percent in the Ramsey model, 2.2 percent in the OLG model, and 1.9 percent in the Solow model. These results are similar to other estimates of consumption tax reforms found in the literature.